We will start the excursion with an escape to the past, walking through the Monastery Santa Teresa; one of our monuments that belong to the most important attractions of Arequipa city. This Monastery was built on 1710 and offers to visitors an incredible Museum with eleven galleries; in addition to the Church, some of these rooms still being used by the nuns of the Carmelita Order. We will continue the visit walking through our Main Square and visiting the Compañia Church, famous because of its incredible baroque style and the colorful Cupola of Saint Ignacio. 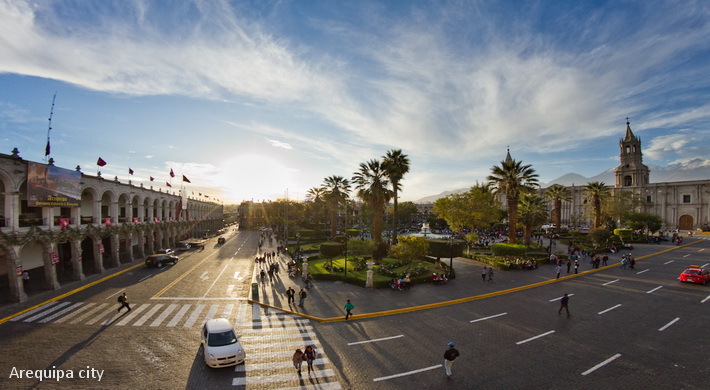 After these visits we will leave the city center and drive to the traditional town of Yanahuara, popular for its beautiful plaza where we’ll have a view over Arequipa and its volcanoes Misti, Chachani and Pichu Pichu. What is Included? What is not included? Tucanos Peru: "Travel Agency & Tour Operator"